For other uses, see Terminal velocity (disambiguation). The downward force of gravity (Fg) equals the restraining force of drag (Fd) plus the buoyancy. The net force on the object then, is zero, and the result is that the velocity of the object remains constant. In fluid dynamics, an object is moving at its terminal velocity if its speed is constant due to the restraining force exerted by the fluid through which it is moving . As the speed of an object increases, so does the drag force acting on it, which also depends on the substance it is passing through (for example air or water). 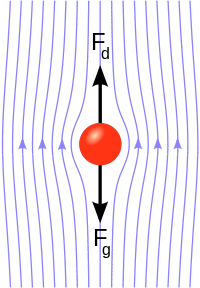 At some speed, the drag or force of resistance will equal the gravitational pull on the object (buoyancy is considered below). At this point the object ceases to accelerate and continues falling at a constant speed called the terminal velocity (also called settling velocity). An object moving downward faster than the terminal velocity (for example because it was thrown downwards, it fell from a thinner part of the atmosphere, or it changed shape) will slow down until it reaches the terminal velocity. Drag depends on the projected area, here, the object's cross-section or silhouette in a horizontal plane. An object with a large projected area relative to its mass, such as a parachute, has a lower terminal velocity than one with a small projected area relative to its mass, such as a bullet. Based on wind resistance, for example, the terminal speed of a skydiver in a belly-to-earth (i.e., face down) free fall position is about 195 km/h (120 mph; 54 m/s). This speed is the asymptotic limiting value of the speed, and the forces acting on the body balance each other more and more closely as the terminal speed is approached. In this example, a speed of 50% of terminal speed is reached after only about 3 seconds, while it takes 8 seconds to reach 90%, 15 seconds to reach 99% and so on. Higher speeds can be attained if the skydiver pulls in his or her limbs (see also freeflying). In this case, the terminal speed increases to about 320 km/h (200 mph or 90 m/s), which is almost the terminal speed of the peregrine falcon diving down on its prey. The same terminal speed is reached for a typical .30-06 bullet dropping downwards—when it is returning to the ground having been fired upwards, or dropped from a tower—according to a 1920 U.S. Army Ordnance study. Competition speed skydivers fly in a head-down position and can reach speeds of 530 km/h (330 mph; 150 m/s); the current record is held by Felix Baumgartner who jumped from a height of 128,100 feet (39,000 m) and reached 1,357.6 km/h (840 mph; 380 m/s), though he achieved this speed at high altitude, where extremely thin air presents less drag force. To the mouse and any smaller animal [gravity] presents practically no dangers. You can drop a mouse down a thousand-yard mine shaft; and, on arriving at the bottom, it gets a slight shock and walks away. A rat is killed, a man is broken, a horse splashes. For the resistance presented to movement by the air is proportional to the surface of the moving object. is the projected area of the object. In reality, an object approaches its terminal speed asymptotically. in this and subsequent formulas. The terminal speed of an object changes due to the properties of the fluid, the mass of the object and its projected cross-sectional surface area. Air density increases with decreasing altitude, at about 1% per 80 metres (260 ft) (see barometric formula). For objects falling through the atmosphere, for every 160 metres (520 ft) of fall, the terminal speed decreases 1%. After reaching the local terminal velocity, while continuing the fall, speed decreases to change with the local terminal speed. with v(t) the velocity of the object as a function of time t.
Although this is a Riccati equation that can be solved by reduction to a second-order linear differential equation, it is easier to separate variables. A more practical form of this equation can be obtained by making the substitution α2 = ρACd/2mg . with arctanh the inverse hyperbolic tangent function.
. The expression for the drag force given by equation (6) is called Stokes' law. The creeping flow results can be applied in order to study the settling of sediments near the ocean bottom and the fall of moisture drops in the atmosphere. The principle is also applied in the falling sphere viscometer, an experimental device used to measure the viscosity of highly viscous fluids, for example oil, paraffin, tar etc. Settling velocity Ws of a sand grain (diameter d, density 2650 kg/m3) in water at 20 °C, computed with the formula of Soulsby (1997). = drag force acting on the object. ^ "Terminal Velocity". NASA Glenn Research Center. Retrieved March 4, 2009. ^ Riazi, A.; Türker, U. (January 2019). "The drag coefficient and settling velocity of natural sediment particles". Computational Particle Mechanics. doi:10.1007/s40571-019-00223-6. ^ a b Huang, Jian (1999). "Speed of a Skydiver (Terminal Velocity)". The Physics Factbook. Glenn Elert, Midwood High School, Brooklyn College. ^ "All About the Peregrine Falcon (archived)". U.S. Fish and Wildlife Service. December 20, 2007. Archived from the original on March 8, 2010. ^ The Ballistician (March 2001). "Bullets in the Sky". W. Square Enterprises, 9826 Sagedale, Houston, Texas 77089. Archived from the original on 2008-03-31. ^ Haldane, J. B. S. (March 1926). "On Being the Right Size". Harper's Magazine. Archived from the original on 2016-02-13. Onboard video of Space Shuttle Solid Rocket Boosters rapidly decelerating to terminal velocity on entry to the thicker atmosphere, from 2,900 miles per hour (Mach 3.8) at 5:15 in the video, to 220 mph at 6:45 when the parachutes are deployed 90 seconds later—NASA video and sound, @ io9.com.